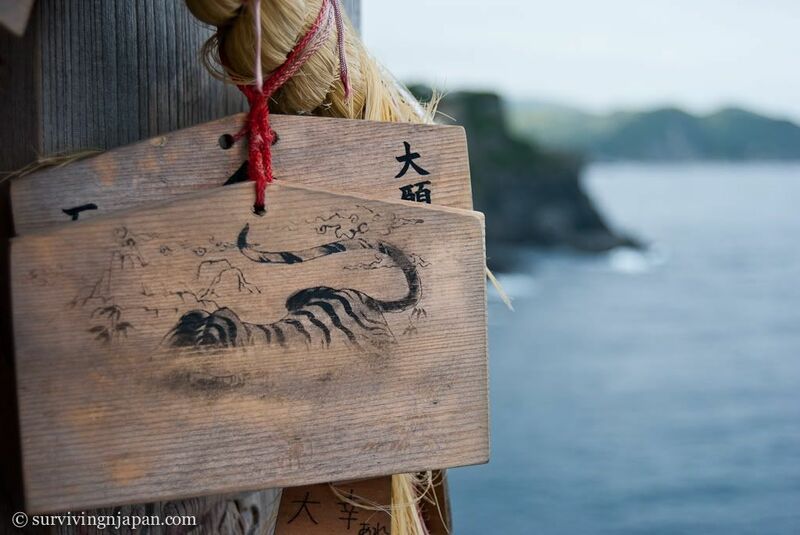 The Izu peninsula of Shizuoka prefecture is one of my favorite places in Japan (although, I haven't been to every part of the country yet...), and I've written about it several times before. 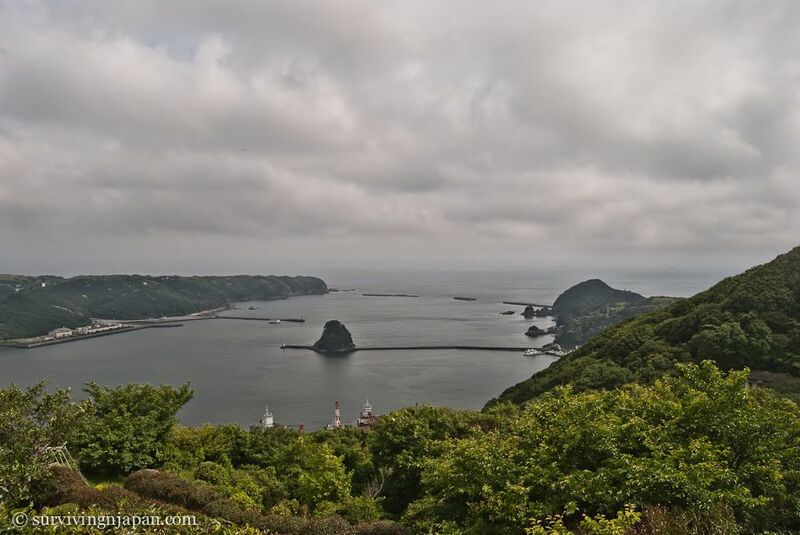 My husband and I decided to take a road trip to Izu this year (in May) for our second anniversary, as we just got a car last winter and I knew from my visits to Izu before that having a car would allow us to explore the area more than I had previously been able to. So I booked us a spot on the Shimizu Ferry that travels from Shizuoka city to the port of Toi (土肥) on the peninsula side of Suruga Bay. 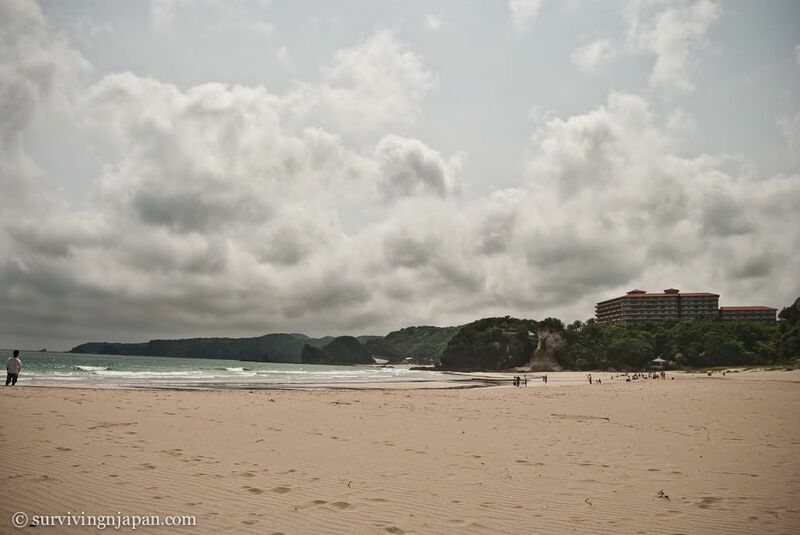 I found a decent deal at a hotel near the beaches in Shimoda (下田), the southernmost city in Izu, known for its many white, sandy beaches. Shimoda is a bit of a drive from Toi (I think it took us an hour and a half or so, but with stops), but the scenery is absolutely gorgeous and I knew we wouldn't get bored at all. As for the ferry ride, it was our first in Japan, and I have to say I was a bit disappointed. Of course, I also come from Seattle (Washington State, US), where we have giant ferries. Not that there aren't giant ferries in Japan, as I'm sure others are (particularly the overnight ones), but this one wasn't as big as I'd imagined it to be. 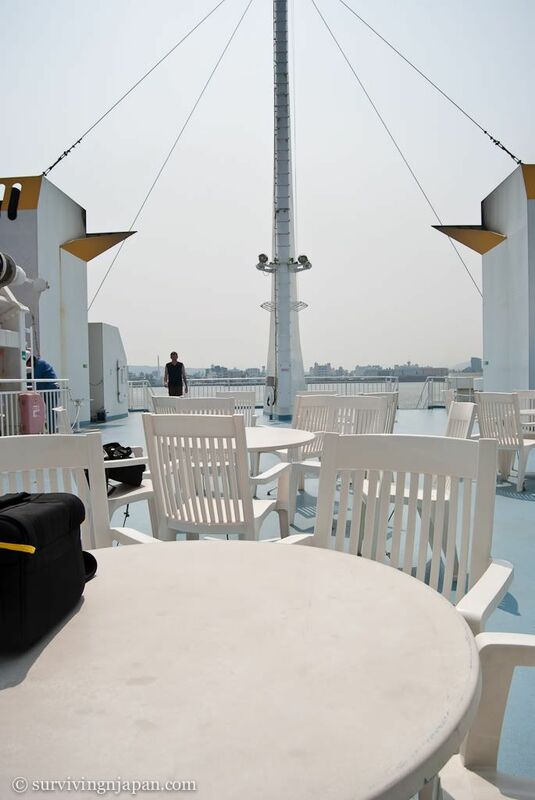 Sitting on the outdoor deck of the ferry. A few other differences I noticed were once you leave your car after parking on the ferry, you cannot go back until the ferry is about to dock again. We also thought they would sell food on the ferry, but all they offered were some drinks (mostly coffee) and a few packaged snacks. I was also fairly surprised at how rocky the trip was, considering it didn't seem that windy, and the ferries I'd ridden before in Seattle never really seemed to rock at all. In any case, it was somewhat amusing trying to walk around, given that my balance was already somewhat off due to pregnancy. After a 56-minute trip, we drove off the boat hungry (despite my slight motion sickness), grabbed some snacks at 7-11, and headed off towards Shimoda. We took the mountain road that cuts through the middle of the peninsula for the trip down. It climbed steeply and much of the drive was spent overlooking cliffs and lush greenery, with various tunnels thrown in for good measure. Eventually we hit Kawazu (河津 - home of the "seven waterfalls" or 七滝, nanadaru) on the east coast of the peninsula and about 20 minutes more until we reached Shimoda. We spent the weekend there, and though the weather was mostly cloudy, we were able to get in a few good hours at one of the nine or so beaches on Saturday. Incidentally, we also happened upon the Japan National Pro Surfing Tour at the beach we went to. 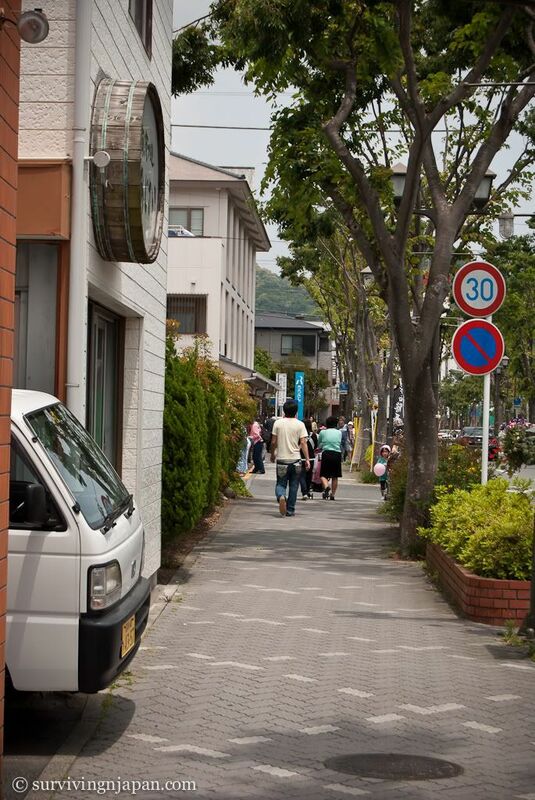 Which reminds me: Shimoda seemed so vastly different to me than so many other parts of Japan I've been to. People just seemed more laid-back and relaxed in general, and the place certainly has the sense of a "beach town." 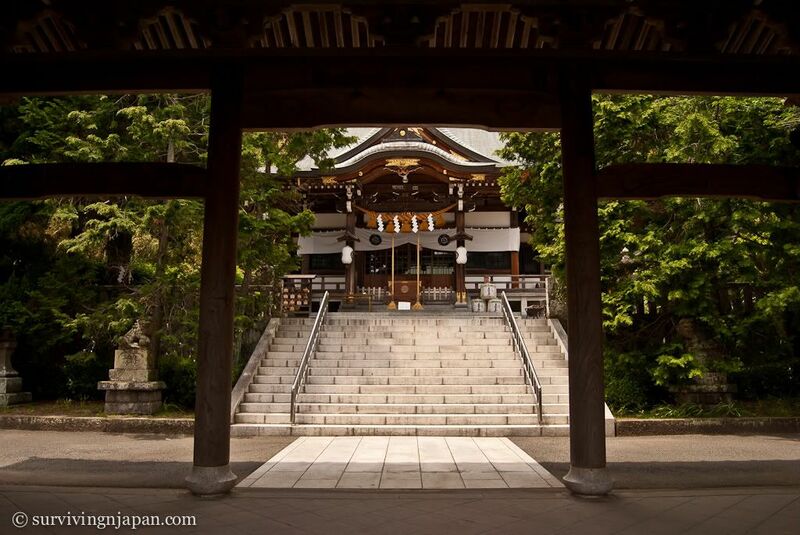 Occasionally, my husband or I would comment to each other about how we didn't really feel like we were in Japan anymore, as it seemed so different. We also explored town and ran into a temple (though there are several). Part of town -- not too exciting. And what else to do on a cloudy day but a very touristy thing. We took the Shimoda Ropeway (下田ロープウェイ) up Nesugata Mountain (寝姿山 - named so because it is said to look like a woman's figure sleeping on her back). At the top there are, of course, tourist shops, but also a walking path, gardens, lookout points, and various other activities. I think there was also a human maze, although we didn't go for that this time around. 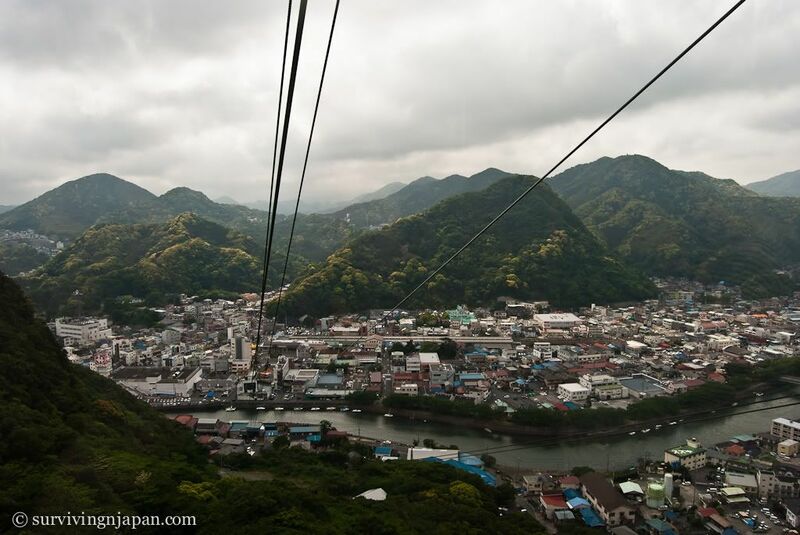 Going up the ropeway; looking over Shimoda. 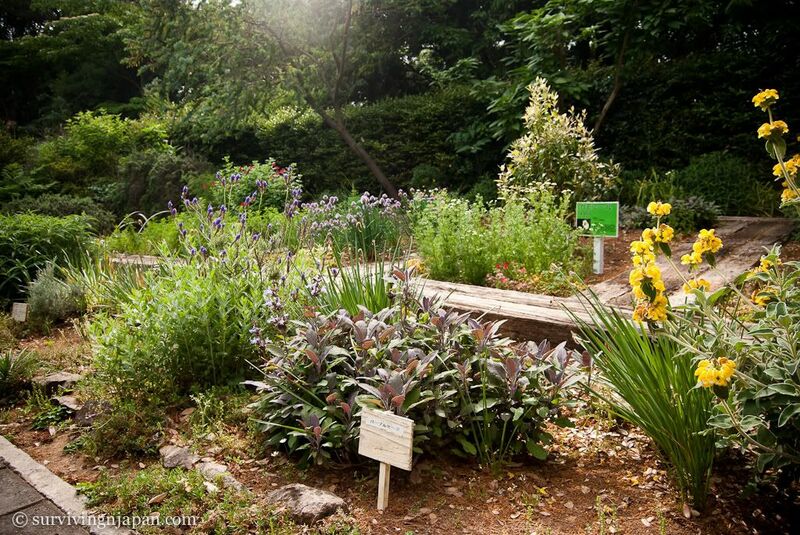 One of the many gardens at the top. Looking out over the Pacific Ocean. I should also note that every year Shimoda holds the "Black Ship Festival" (黒船祭, くろふねまつり, kurofune matsuri), which happens in May. Unfortunately, it was canceled this year due to the Tohoku earthquake/tsunami, so we missed out on the festivities. Another time. 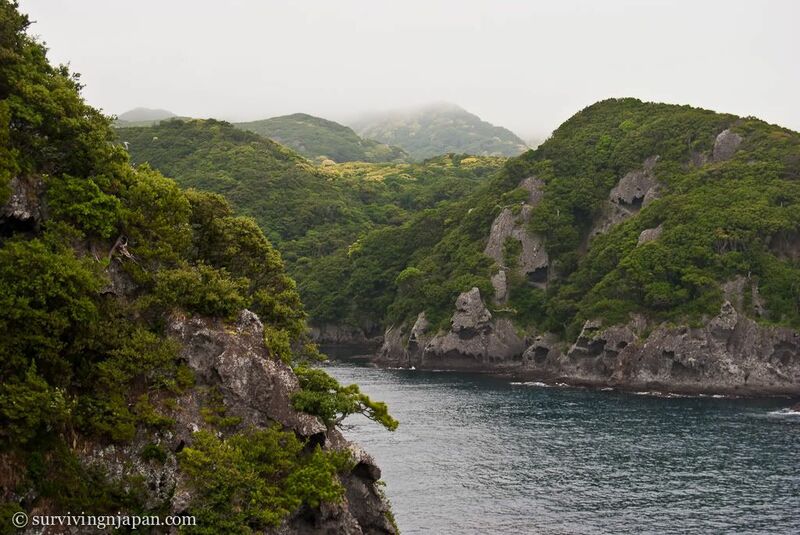 After our time in Shimoda, we headed home Sunday, but this time took the coastal route from Shimoda to Toi. Along the way we stopped at the southernmost tip of the peninsula: Irozaki Coast (石廊崎). 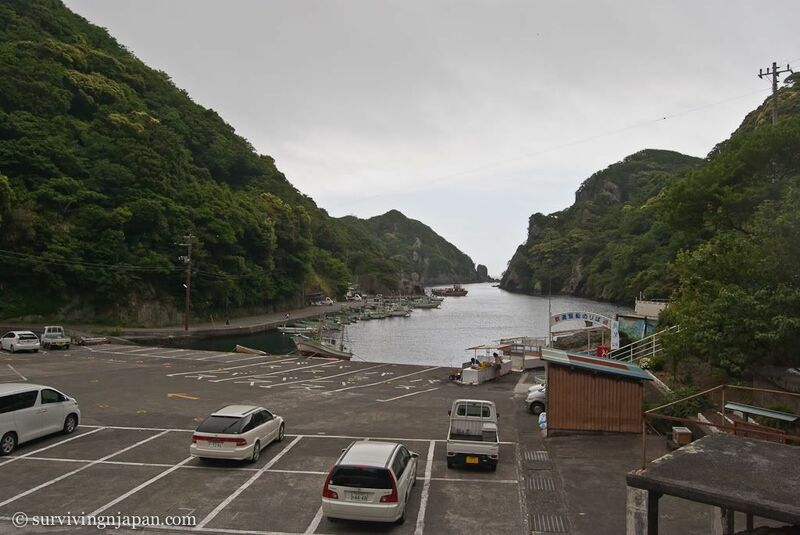 There is a small port at Irozaki, where they apparently hold daily cruises around the coast. The whole area looked pretty desolate when we showed up, and all the tourist shop owners raced out of their stores to call out "welcome" to us -- eagerly hoping, I'm sure, that we would visit their shop. At the top of the cliff, there was an abandoned botanical garden and park. The only thing running was a vending machine. 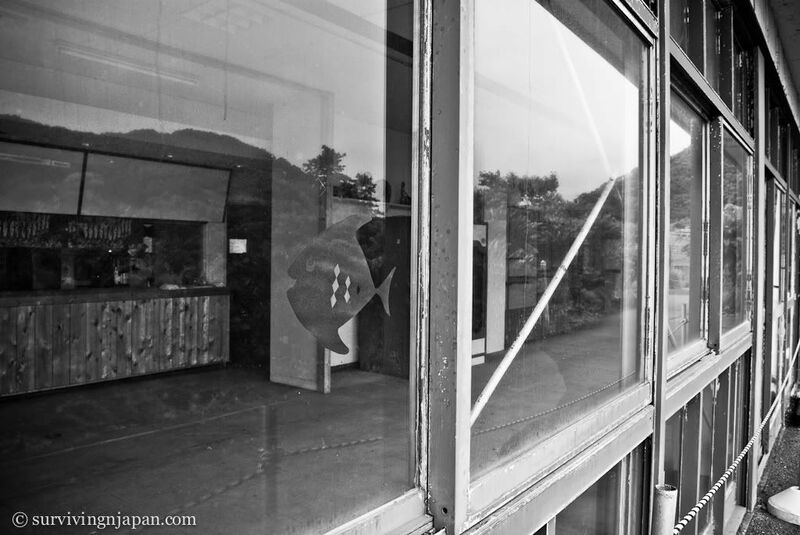 A peek inside one of the abandoned buildings at the botanical garden. The path was relatively flat from this point on, aside from some stairs that climbed down part of the cliff to a shrine built into the rock face. 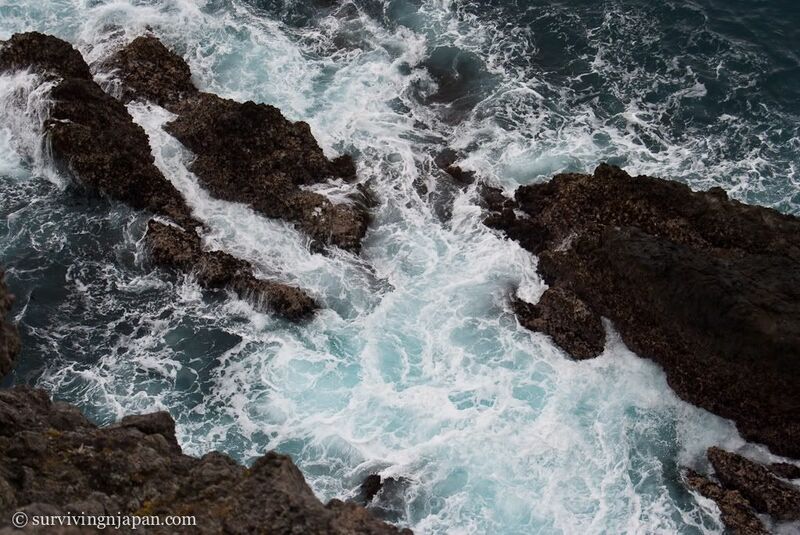 Overlooking part of the cliff and ocean. The shrine built into the rock face. Though it was a rather overcast day, the cliffs and the jungle-like foliage covering them were striking, particularly so with the low-hanging clouds and mist. 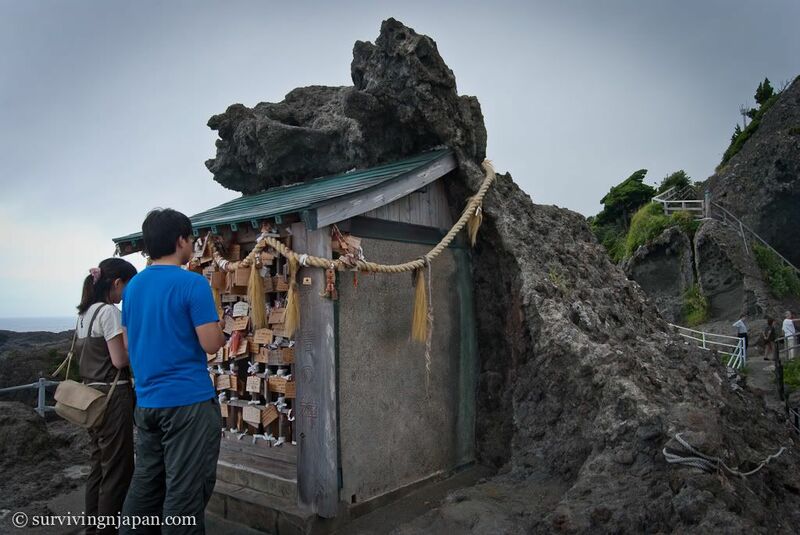 If you'd like, you can write prayers and hang them at the cliff edge, like this couple below. Sidenote: my husband was wearing the exact same shirt as the guy and similar gray pants that day too. After Irozaki we only stopped a few more times as it was raining. There was one place that had a beach with monkeys - supposedly you could walk right up to them and pet or feed them. I'm not a fan of monkeys, but we were curious so we drove down a long, windy, narrow road from the highway to the beach. These monkeys are not wild (or, somewhat domesticated) monkeys, as we thought. The monkey beach was a definite tourist ploy. I think we were their only customers, as when we pulled up they beckoned us to come to the beach (the people that work there, not the monkeys). Although once we realized you had to pay to go to the beach, and that the monkeys were basically locked up in cages and they just let them out for tourists, we decided against it. Like I said, I'm not that into monkeys. 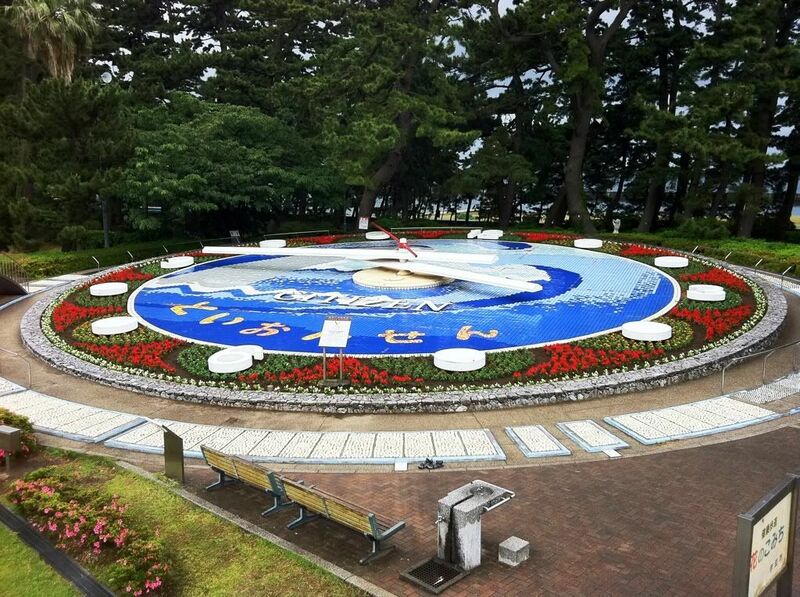 When we arrived in Toi again to catch the ferry back to Shimizu, we had some extra time so we checked out the world's largest flower clock (though, there weren't really any flowers on it) and the "gold mine" that Toi is apparently known for. Well, we didn't actually go in any mines, but they had a lot of omiyage (souvenirs) and items with gold leaf. 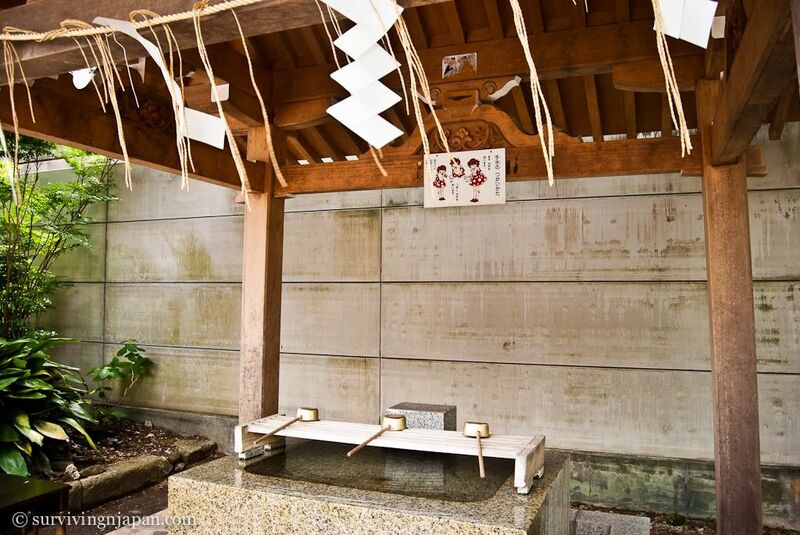 The flower clock has a foot path around it, if you want to "massage" the various parts of your feet, and a lovely little foot bath is located nearby to soak your aching feet afterward. The entire weekend, though short, and despite the mostly gray weather, was definitely relaxing and felt as if we were able to "get away," despite not leaving Shizuoka prefecture (where we live). Exploring Izu by car was definitely a good idea as well. Yes, you can take trains to Izu and get around by bus, but the buses are a bit more infrequent. That doesn't mean it isn't worth it though! I've taken trains to Izu plenty of times before. 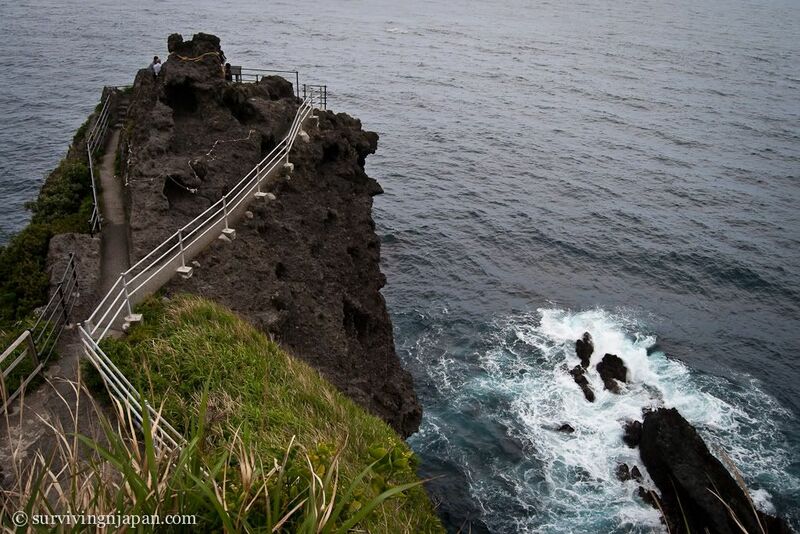 If you ever get the chance to go to Izu, definitely go. 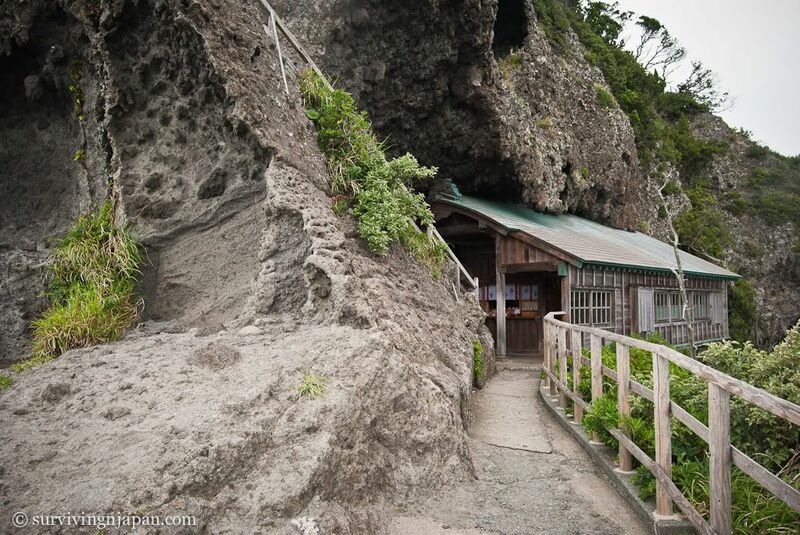 There is a lot to see and do, many onsen to try, and even archery in a volcano. This post is my entry for the July 2011 J-Festa.